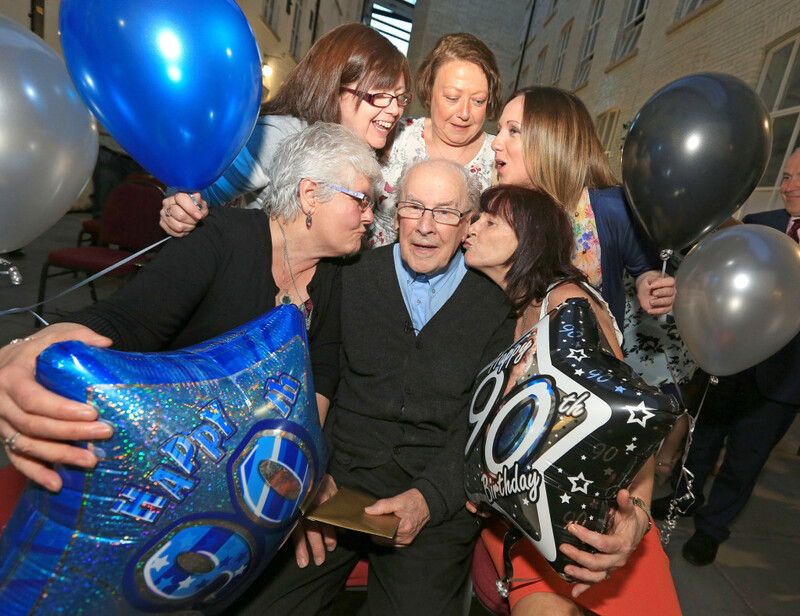 He may be turning ninety, but the impish mischief and kindness which epitomise people’s priest Fr Des Wilson were to the fore last night as he blew out the candles on his birthday cake at a community celebration in Conway Mill. “But don’t put any money on the result of that race because I have a feeling he’ll reach it first,” he joked. Several hundred people from organisations which had worked with Fr Des over six decades of activism in community education, theatre, economic development, journalism and the struggle for civil rights gathered in Conway Mill, a testament to his 30-year battle to turn the venue into a hub of enterprise and endeavour despite a British government embargo on aid to the Mill during much of the eighties and nineties. But central to the night was the community of Springhill and Ballymurphy who had sustained the Springhill community houses — where Mass was said regularly after Fr Des was banned from officiating in church property — alongside Des and the late Noelle Ryan. A TG4 documentary on the proudly rebellious cleric (scheduled for screening at 10.20pm on Thursday, July 2) was screened for the birthday party audience before the Féile Women’s Choir serenaded the birthday boy with a series of inspirational songs including ‘Something Inside So Strong’. While I at ninety am still inhaling heartily. After a lifetime believing he wasn’t well. With his friends all trying to work out what a severe surfeit was. Happily it was nothing at all. Although they had no magnification in them at all. Maybe that’s the secret of a long life. Happy mystification without the unnecessary magnification. Things wrong with them to show they were normal. Or a hundred and four — we’ll not argue about it. But only if all of us could do it together.